As I write to you, the country is descending further and further into chaos, that chaos including a level of racial violence few of us thought we should ever see again on our streets. (How foolish we were, or at least how foolish I was!) Not a word of condemnation is uttered by those who voted for us to leave the European Union, which tells us much of what we need to know about them. The country threatens to drag the rest of Europe with us, and who knows how much else of the world? And for what, so that Boris Johnson could realise his dream to lead the Conservative Party? A supreme careerist, he now clearly does not even want to leave the European Union; whatever Johnson might be, and I fear I lack the vocabulary to describe him, he is not a man of principle. Perhaps, then, there might lie a chink of light in that unquenched ambition. I am more inclined to place my faith in the twin wisdom of Nicola Sturgeon and Angela Merkel. However, we should clearly accept help from wherever it comes at this point. As an academic, I know only too well how catastrophic departure from the EU would be for our universities. The Principal of my own institution, Royal Holloway, University of London, has been doing a good job in trying to calm nerves a little, but that, sadly, is all he can do at the moment. As a Londoner, I know how catastrophic departure would be for this city; moreover, I see the terrible damage already being done to our open, inclusive city. London’s response to the referendum could hardly have been clearer. I know only too well the fears of EU residents concerning the future. Many of them are my close friends; many of them are my colleagues; many of them are my students. As a constituent of yours, I also know only too well the dangers further violence could hold for Tower Hamlets. We have built something of which we can and should be proud here; we must do whatever we can to safeguard that and to go further. 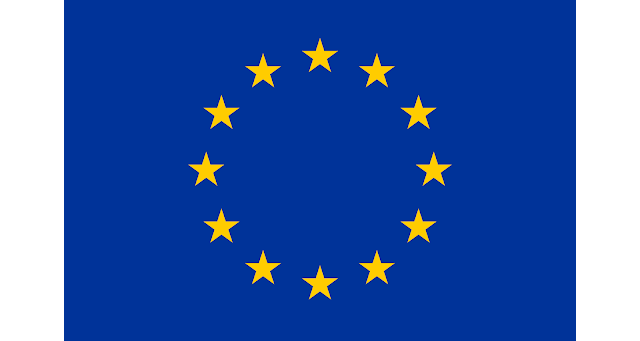 As a European, I am fiercely proud of our continent’s common heritage: not in an exclusive sense, but as a recognition of who we are, of what we have done well, of what we might continue to do well, and, most importantly, of what we might do better. That will, quite simply, not be possible, should we leave. I could go on, but I am sure that you know all of that and more already. I implore you then to do whatever you can. Your constituency, your city, your country, your continent, your world, and, yes, history will thank you for it. For once, such apparent hyperbole is not, remotely indicative of exaggeration. Thank you very much for all you did during the referendum campaign; I can assure you that it has not gone unnoticed by this grateful constituent. Peter Maxwell Davies’s last major work, a children’s opera, The Hogboon, here received its world premiere. It may not be a musical masterpiece on the level of a Birtwistle opera; I doubt that anyone would make such a claim. That, however, is not really the point. 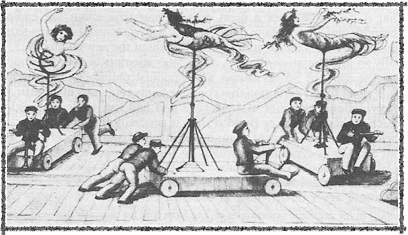 It seems to me the very model of a community opera, offering a good story and good music both to amateurs, indeed to children, and to professionals; this was an opportunity and an experience many of those taking part are unlikely ever to forget. We need to do much more of this sort of thing, and who could set a better example than the LSO and Simon Rattle? Something for royalists too: the work is dedicated to the Queen on the occasion of her ninetieth birthday. Each house in Davies’s beloved Orkney is said to have its own Hogboon, a familiar spirit who, in return for food and drink left out every night, tends to its family’s wellbeing. In this case, the Hogboon helps Magnus, seventh child of a seventh child, mocked as useless by his Six Elder Brothers, to defeat the Nuckleavee sea-monster, averting the threat of that monster breakfasting on six golden-tressed maidens and the daughter of the Earl of Orkney. How is that accomplished? By music and dance. As a reward, Magnus is betrothed to the Earl’s daughter, and the boy’s brothers receive those golden-tressed maidens in marriage. There is a social and environmental message: care for each other and for the world around us. It is lightly worn, and perhaps the more convincing for that. 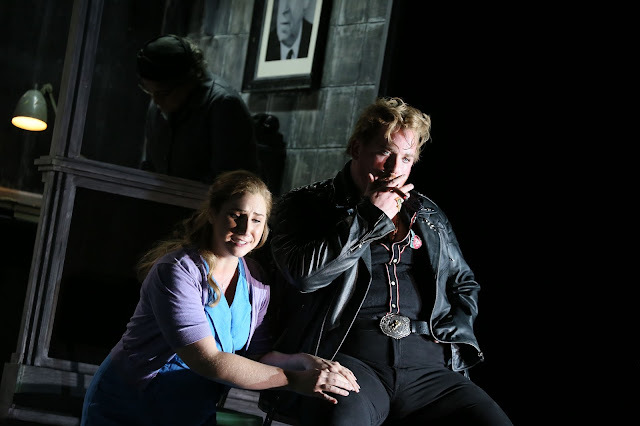 Give or take the odd unfortunate updated Tippettism in the composer’s own libretto – ‘Have we shown disrespect to your otherness?’ does not appear to be intended ironically – the story works well over the course of a little under an hour. So does the score. Davies, needless to say marshals his forces well, offering them apt, challenging, yet eminently performable music. (Performances were certainly eminent on this occasion.) There is bold, large-scale orchestral and choral writing, tuneful solo vocal writing, nothing outstaying its welcome, with a wide variety of expressive means and plenty of variation. For instance, following the opening ‘Nucklavee!’ chorus, a beautifully written (and here, beautifully played) flute interlude leads into Magnus’s song by the peat fire of the heroic deeds to which he believes he will one day be called (and, of course, will). 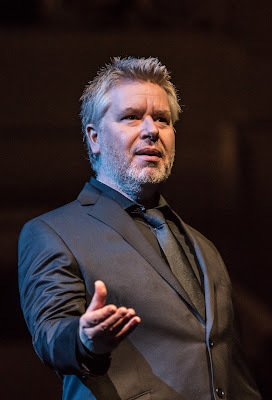 The melody is in many respects quite conventionally operatic; the excellent treble, Sebastian Exall, here and elsewhere took well his opportunity to shine. I am sure we shall hear more from him. Brass from the back of the hall herald the Hogboon’s arrival; there is some splendid post-Mahlerian band music when the players are joined by onstage wind. The Good Witch’s Cat is undoubtedly – well, catlike, her feline vocal and stage presence adding much to the fun of proceedings. Singing and dancing were all very well coordinated. There is even a non-singing role for a Bat, flying through the auditorium, here taken by young Lucas Pinto. And the final farewell – ‘And so goodbye. God bless you all. Goodbye.’ – proves both rousing and moving. Many congratulations to all concerned! Another splendid example of cooperation was offered by the combined forces of the LSO and students from the Guildhall School, next door. What a wonderful luxury it was to hear the Symphonie fantastique with such large (and excellent) forces, just what Berlioz – for whatever this is worth – always ‘intended’. I counted, for instance, no fewer than twelve double bass players and six harpists: not bad at all for the Barbican. I wonder also whether the circumstances led Rattle to be less idiosyncratic than he has often shown himself to be in recent years. Whatever the reason, this was a far more satisfying performance than I have heard from him in quite some time. The LSO, with its long Berlioz tradition, above all with Colin Davis, but stretching back much further than that, sounded in its element; so did its young guests. Indeed, had I not known, I cannot imagine that I should have guessed this was a ‘combined’ orchestra at all. The fabled attack and precision of the LSO was matched note for note by its partner musicians. The opening bars of the first movement sounded fragile and intense; indeed, string vibrato considerably more intense than one generally hears, and all the better for it. The introduction was moulded, yes, but not unreasonably so. Indeed, its moulding struck me almost as a musical equivalent to the composer’s unquestionably ‘interventionist’ Memoirs. This was probably a more ‘Romantic’, less ‘Classical’, account than one would have heard from Davis: an exciting new chapter beginning, perhaps? Yet, by the same token, there were times when Rattle would stand back and simply let the orchestra play: another excellent sign for the future. Insanity shone through, but it was not arbitrary: this was disciplined madness. The second movement really danced, with grace and menace: sometimes in turn, sometimes in contest. We heard the cornet solo for once too. The music glittered and was gay; it had splendid swing. And the power of the whirling vortex towards the close was quite something indeed! I was struck by the extent to which the opening duetting in the ‘Scène aux champs’ was heard musically: this was counterpoint as well as the instantiation of a programme, indeed arguably more the former than the latter. There was dramatic, quasi-operatic tension, although the theatre remained, of course, a theatre of the mind. Beethoven’s precedent was clear: not just the Sixth Symphony but also the Ninth. For music of the music sounded akin to accompagnato or arioso; I began to wonder also about possible Gluckian precedents here. The eloquence to the great melody on the cellos was certainly such that it might have been a vocal solo of its own. Timpani rolls sounded as much symphonically anticipatory as ‘atmospheric’. That near-verbal – and yet, by the same token, resolutely non-verbal – eloquence continued in the ‘March to the Scaffold’. It was not, though, at the expense of any martial quality; the two tendencies incited one another. Brass were as resplendent as one might have expected, but there was menace in their muffled tones too. The finale proved both catchy and grotesque, and not only from the superlative woodwind. The Dies irae music, whatever the composer’s ‘intentions’, sounded both chilling and, I think, witty. ‘Rollicking’ is perhaps an adjective too readily attached to ‘finale’, but here it seems inescapable. Exhilarating! Culture, education, young people, London: as victims of the present chaos go, it would have been difficult to find a better example than those playing at and in the audience for, this concert. The response was the best possible: defiant excellence. Many thanks then, to the Melos Sinfonia and Oliver Zeffman, for a light in the darkness at this catastrophic time in our country’s – and Europe’s – history. I have begun to warm to Dutilleux’s music in his centenary year. It had not properly ‘spoken’ to me before, but Sur le même accord certainly did on this occasion. So named on account of the six-not chord introduced at the opening, which provides the material for what comes thereafter, Sur le même accord benefited greatly from ardent advocacy from Martyn Jackson and the orchestra. Jackson’s declamatory pizzicato opening presented a storyteller: almost as if he were telling us ‘Once upon a time…’. Premonitions of Rimsky-Korsakov already – or should that be echoes? Thinking of Russian composers, Prokofiev often came to mind, although so too, to a lesser extent, did Berg; there were definite post-war episodes, though, not least an almost Messiaen-like marimba intervention. Jackson’s richly seductive line sounded as first among equals, for not only were there several other splendid solos to enjoy (for instance, from clarinet and cello), but the work’s dealing, in Dutilleux’s words, ‘with the abstract relations within the orchestral universe’ came strongly to the fore. There has never, so far as I can recall, been a time when warming to Haydn’s music proved a problem for me. This performance of the C major Cello Concerto, with Bartholomew LaFollette the outstanding soloist, reminded one of so many of the virtues of that great European. (Only a fool would ascribe to him ‘nationality’; alas, there are many fools around.) The first movement opened warmly; it was stylishly, meaningfully articulated, properly dynamic in its conception of form. That was even before the solo entry. LaFollette’s playing showed much the same characteristics. And what a splendid sense of line there was to be heard: gorgeous yet never self-regarding in tone, clean and clear. Crucially in Haydn, this was a performance to have one love the music – and indeed its composer. Civilisation seemed still to be with us, or at least near, the elegance of LaFollette’s playing, not least in the cadenza, putting me in mind – and no, I am not exaggerating – of Tortelier. Wonder of wonders, we heard an Adagio that was an Adagio. It sang beautifully, honestly; I almost wished our Scheherazade would start again. A slightly subdued opening to the finale had me wonder to start with. It proved, however, to have been a subtle trick, much in the spirit of the composer, for suddenly, without vulgarity, there came full orchestral sound and vigour. There was much play like that – and in many other ways. It made me listen – and what a joy it was here to listen. Rimsky’s Scheherazade was our work for the second half. Zeffman was clearly in his element – although he had been no less in the first half. I was intrigued by the way this symphonic suite proved as much a study of ‘relations within the orchestral universe’ as the Dutilleux piece had; both, of course, benefited greatly from the excellence of Martyn Jackson on violin (now as leader). Its opening was formidable, the Melos Sinfonia’s brass more than a little ‘Russian’ in their vibrato. The response, needless to say, was silky and seductive. Subtle dynamic gradations, not in the least pedantic, proved as expressive as harmony and orchestration, Sinbad and Prince Kalender coming vividly to life. Glorious string sheen, even from a relatively small band, helped no end; much the same might be said for perky woodwind. There was exoticism, of course, but it always felt – indeed, was – directed. A keen sense of narrative, whether or no it might actually be put into words, was always present. Transformation of themes proved both a pictorial and an intellectual delight. If Liszt inevitably came to mind, so too did the future, of both Strauss and Stravinsky. There were symphonic correspondences; quite rightly, however, this remained a suite rather than failing as an aspirant symphony. For all its supposed renown, this is not a work we hear very often in the concert hall; I am not sure that I have ever done so before. There is all the more reason, then, to applaud so fine a performance as this. This was my first visit to the Wigmore Hall’s series of late (10 p.m.) Friday evening concerts; I am sure that it will not be my last. It is a wonderfully civilised time to hear music, and these were wonderfully civilised performances of wonderfully civilised music. Adam Walker and Mahan Esfahani left one wanting more – which is just as it should be. The fourth of Couperin’s Concert royaux made for an arresting and varied opening work. Its Prélude offered impetus and leisure; what could be more Versailles-like? Harmonies and melodies alike proved generative, but above all juste. The Allemande proved a playful response (even, I am attempted to suggest, quasi-liturgically and with an ear to the Boulezian future, a playful répons). Yet, as one listened, many of the same qualities as those heard in the preceding dance were revealed. The first Courante likewise presented continued affinity and difference: very much the trick in a Baroque Suite (so very different from the world of sonata form). In that ‘French’ dance, and in its ‘Italian’ counterpart, variegation was very much the thing. Character without exaggeration was to be heard and experienced; we were made, or perhaps better, gently yet firmly led, to listen. Dynamic contrasts, terraced and otherwise, were always meaningful, always tending towards musical explication. The Sarabande, graceful, but certainly not in a merely generic way, had me visualise knowing glances between dancing partners. A keen Rigaudon and a Forlane (opening with Esfahani tapping the rhythm on the case of the harpsichord) of impeccable rhythmic, and thus melodic, impetus proved both charming and exploratory. Two Quantz Capriccii for solo flute followed. Walker truly transformed what can easily sound like mere studies – in a way, that is precisely what they are – into music, beautifully phrased and shaped. Esfahani joined him once again for Franz Benda’s E minor Sonata (published in 1756). Again, juste was the word that came to mind in the first movement, ‘Largo, mà un poco andante’: not just in mood, not just concerning tempo, but also with respect to its status as chamber music in the truest rather than just the default sense. The second movement, ‘Arioso, un poco allegro’ proved both quickened and quickening. It was absorbing to follow its twists and turns, our musicians the surest of guides. More than that, it was fun. Rhythm and harmony likewise worked together in the final ‘Presto’, goading each other to the conclusion. Esfahani had the stage to himself for two ‘Le Forqueray’ pieces, the first by Rameau, the second by Jacques Duphly. In the former, rhetoric ‘spoke’, without the exaggeration sometimes marring performances of such music as music. Rather to my surprise, although I greatly enjoyed the busy quality of that piece, I found that Duphly’s perhaps went deeper. Or at least its mood was more thoughtful (the piece, that is, for both performances were excellent). Rubato was well judged: enhancing, enticing. Pierre Danican Philidor’s E minor Suite concluded proceedings. The variety of flute colours summoned up by Walker from his instrument was not the least of the joys of the Prélude. Likewise the colours from Esfahani’s harpsichord. The players took their time, and the performance was all the better for it. Much the same might be said of the ensuing Allemande, although its mood and its mode of eloquence were, of course, quite different. The Sarabande took my mind back to that of Couperin, as much on account of subtle difference as kinship. The give and take between musicians ensured considerable variety, without sacrifice to a strong sense of the whole. The final Gigue did just what a Gigue should. Far less hard-driven than one too all often hears, this was a musical delight to conclude an evening of similar yet different delights. This now seems as though it took place in another world – because it did. I nearly did not make it, waiting more than half an hour to change trains at Tower Hill, before desperately trying to find a cab to take me to the Coliseum. Yes, that monsoon rainfall that hit London – and, well, you know the rest… In some ways, it was fitting, if heartbreaking, that this outstanding demonstration of European internationalism should have opened on the night it did: the night when the forces of bigotry, those who would have stoned Jenůfa, took us where they did. I might have preferred to hear Jenůfa in Czech, but who cares? Although the words – excellently translated, insofar as I am competent to judge, a considerable ‘insofar’, although compared to my countrymen and, to a lesser extent, countrywomen… - sometimes sound in themselves a little odd in English, they and their meaning were powerfully, indeed viscerally conveyed. (I know that ‘visceral’ is a much overused word in such contexts, but here it certainly was the mot juste, or whatever ‘decent’ English phrase that fascist Farage would have us use.) Moreover, hearing the words in English certainly had the advantage for a non-Czech speaker – my fault, I know – of underlining when words, especially but not only when repeated, took on not only vocal but orchestral life of their own as speech rhythms (even if the speech rhythms were thus a bit peculiar!) That cavil-which-is-not-a-cavil will be really my only attempt at finding one, for this was magnificent, a reproach not only to xenophobes but to all those who have wished ENO ill, and who, in certain case, continue to do so. The (relatively few) reservations I had about David Alden’s production last time around in 2009 have either evaporated or, seemingly, been dealt with in revision. Perhaps it was as much a matter of the outstanding performances we saw on stage – although they were pretty good too in 2009. I am not entirely sure which, since it is always difficult, no impossible, to remember precisely what happened when, so shall not offer detailed comparisons. 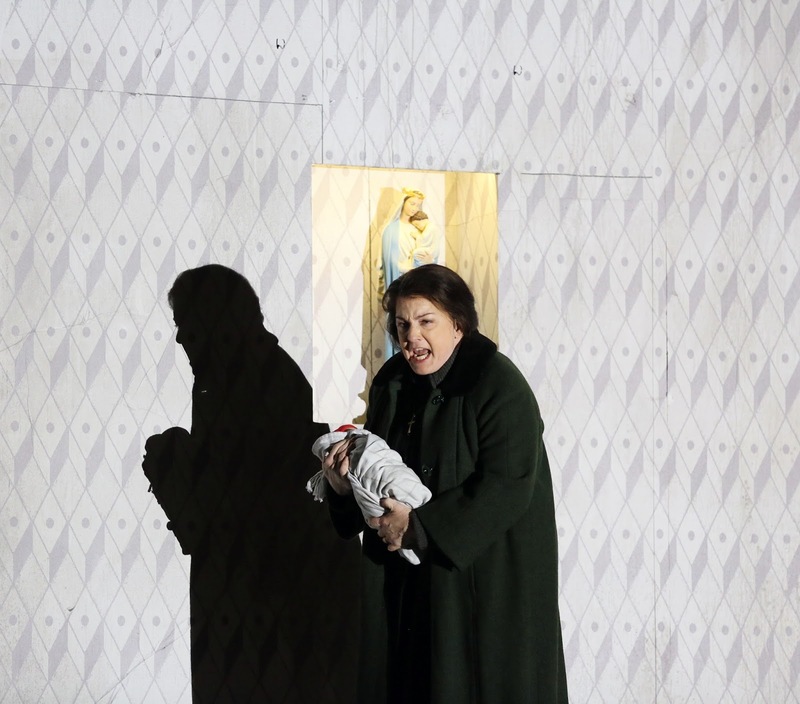 At any rate, the shift from Czech Hardy-land – I was put in mind of Boulez’s less-than-favourable description of earlier Janáček as ‘Dvořák in the country’, thereby exalting the late works to which he came to, well, late – to a more overtly, at least to us rootless cosmopolitans, vicious urban-ish setting, perhaps holding something in common with Christoph Marthaler’s Paris Katya Kabanova. The people are poor and they live in a small, ‘tight-knit’ community, with all the problems that brings: that is what is important, not whether we see lots of wheat sheaves or whatever. Indeed, a sense of the bucolic might be argued to distract from the tragedy at hand; that is certainly given no chance of happening here. 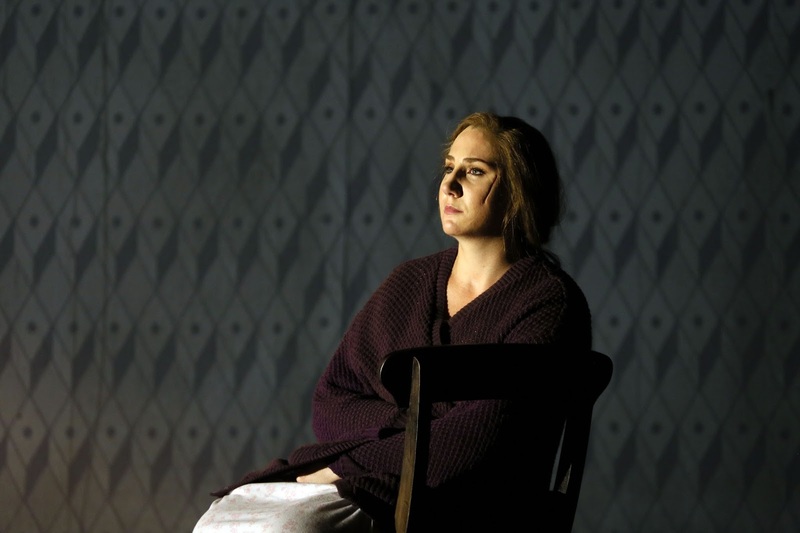 Charles Edwards’s brilliant designs, Jon Morrell’s costumes, Adam Silverman’s costumes, the choreography of Claire Gaskin, here revived by Maxine Braham: all these combine with Alden’s razor-sharp focus upon human tragedy to present something out of the normal (and that is before we even come to the music). Walls close in, the storm intervenes, worlds (visual) collide, often with the greatest physical menace. 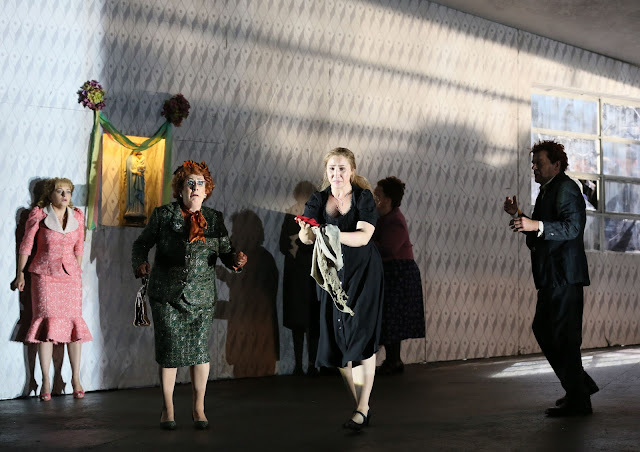 The Mayor’s Wife outfit and make-up are just as much part of the drama, as the terrifying rattling on the shutters of the Kostelnička’s house and the eventual smashing of the glass. Gesamtkunstwerk is a word so divested of meaning, historical or contemporary, that it is perhaps beyond salvation, but if salvation there might be – and there is precious little chance of that dramatically – this would offer unimpeachable witness. 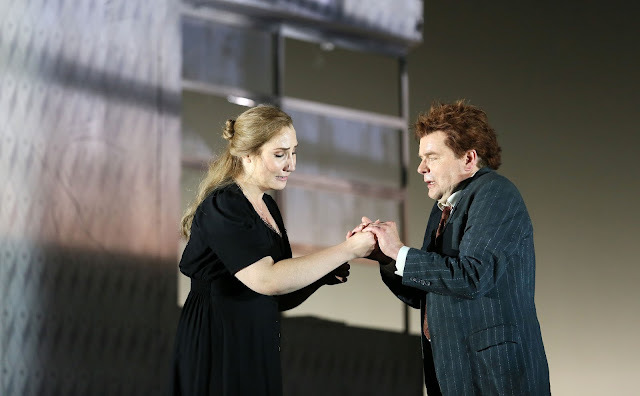 If I find some of the deviations from the naturalistic a little peculiar in themselves, they serve that greater purpose; indeed, when considering that, I recalled Alden’s brilliant ENO Peter Grimes. 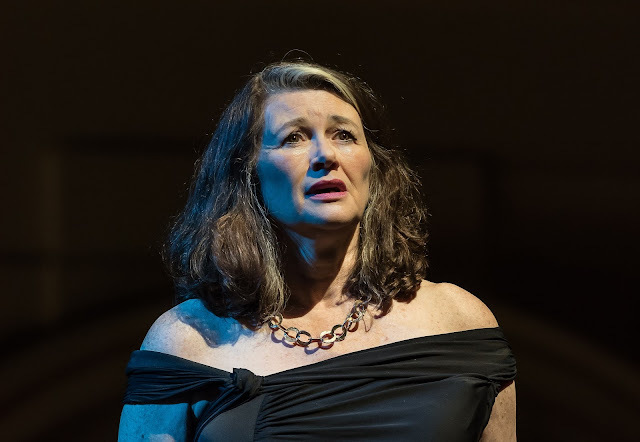 I was less troubled there by such matters, perhaps because I like the work ‘itself’ less; that, though, should not be the point, and the greater dramatic point of small-community, small-minded bigotry punches one in the gut just as it did in Britten’s opera. The advance of the chorus, the villagefolk gunning for their primitive, punitive, perverted ‘morality’ will long remain in the mind; so will the cowardly attempt at rescue of a broken Števa. Here, wall-hugging, often rightly derided, had justification, the desire both to escape and to self-incarcerate inescapably drawn to the fore. I cannot recall hearing a finer performance from the ENO Orchestra. Mark Wigglesworth’s conducting – he must be brought back as Music Director, with a settlement for the company to match – was the most intense I can recall in this work, perhaps in any Janáček opera. It grabbed one by the throat, just like the work of a great conductor in Wozzeck, and never relinquished its grip. 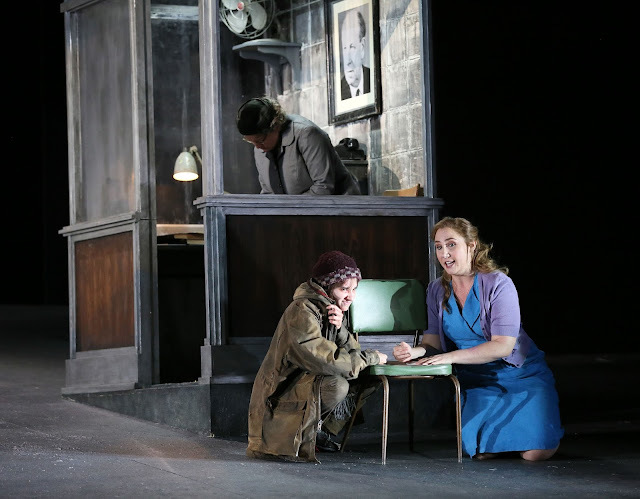 It was not all fierceness, though; the open, sympathetic, European humanity of Janáček’s score shone through all the more warmly in the context of such an agón. The pounding repeated chords at the second half registered all the more strongly for the turmoil both onstage and in the world outside; but they were the orchestra’s and Wigglesworth’s too. Biting, ferocious, generative: they were everything a musico-dramatic prelude should and must be. As the lights flickered in duet with the xylophone, a world internal and external shook. Wagner has no monopoly in operatic renewal of Attic tragedy: this was a communal and, yes, a political rite. That warm sympathy was equally apparent in Laura Wilde’s lovely account of the title role. This was no stock object of sympathy, of circumstance; we experienced her agonies, but as an agent too, albeit, like us, an agent constrained, (near-)destroyed by her ‘community’. 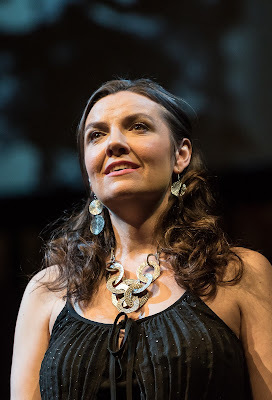 Michaela Martens, almost the only returning member of the 2009 cast, again presented a woman of strength as well as goodness, that strength smashed to pieces – how broken she looked and behaved in the third act! – by what she had done. Vocally, she soared; dramatically, in the very best sense, she plummeted. Valerie Reid was similarly broken by that stage as Grandmother Buryja. She intrigued, as the finest performances of this curious role will: we knew that she and whatever mistakes she had made were fundamental to the tragedy unfolding, without ever quite knowing what they had been. We guessed, though, thus making us complicit with the chorus of terror. Its magnificent contribution throughout, beyond ‘visceral', if something can be so, was yet another standing rebuke to the encircling vultures: ironically so, given its members roles as just that. Peter Hoare’s Laca took us on as moving a ‘journey’, with apologies for the cliché, as that of Jenůfa; youthful (in knowing excess?) silliness was transformed into diffident, difficult maturity. I was quite unprepared for the violence of Nicky Spence’s first-act Števa. Again, being rid of the bucolic doubtless helped, but what generally comes across as winning charm was here a brazen display of power from the start, somewhat tempered, eventually, by Jenůfa’s intervention towards the end of the act, but only somewhat. That rendered his ghost-like appearance and disappearance all the more terrifying in the final act. 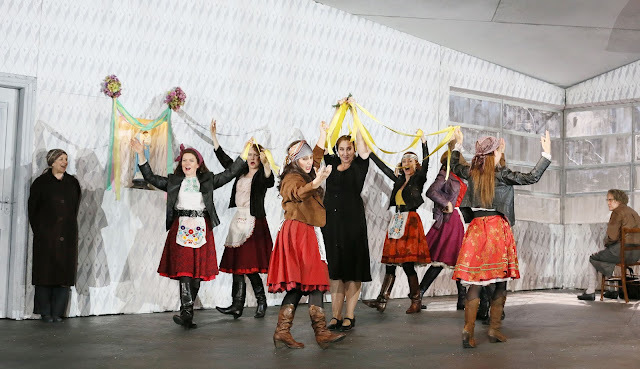 Sarah Labiner’s splendidly boyish Jano, Soraya Mafi’s spirited Karolka, Graeme Danby’s skilfully differentiated roles Natalie Herman’s nasty-piece-of-work Mayor’s Wife: they and all the rest contributed to a true company performance. Even in, particularly in, the direst of tragedy, we find our catharsis somehow. And so it is here. I doubt that these hasty scribblings will persuade, or even dissuade, anyone now; so, like much else over the past few weeks and months, consider it, if you will, a futile gesture or even an attempt at self-therapy. Today will be nerve-wracking; tonight will probably be worse still. We all remember the night of the last general election; having been out for dinner and somehow shielded myself from the results, I arrived at a party, to find instead a wake. The selfish, the bigoted, the merely provincial (nothing to do with where one lives: everything to do with a state of mind) triumphed then; ever since, we have suffered a wholesale assault upon what remains of the social fabric of this country, to make that of Margaret Thatcher, even that of the dread ‘Coalition’, seem almost social democratic in its qualities of reconciliation. This, however, is far more important still. That vilest of selfishness has been on display again, not just from the outright xenophobes and racists, but from so-called socialists (people such as John Mann and, more sadly, Dennis Skinner) who, in their neo-Stalinist fantasy of ‘socialism in one country’, have shown how little they care for internationalism, and also of course from David Cameron’s unforgivable pursuit of ‘special status’. We do not want a ‘special status’; we hold no truck with philistine exceptionalism; we are European and that is all we want: no more, no less. There are good reasons, unanswerable reasons, to oppose what the European Union has become. They come almost entirely from the Left. The despicable treatment of Greece would have made anyone reconsider; yet, in that case, let us listen to Yanis Varoufakis, who considers it crucial for reform of the organisation that has treated us country so brutally that we participate. By ‘we’ I mean both this country and the Left. No one would deny the EU’s neo-liberalism; for us, however, it has long been almost the only brake we have upon still worse neo-liberalism at Westminster. The Social Chapter has long been almost the only protection – however weak – for British workers against the ever-increasing rightward drift of government (both Conservative and New Labour). It was a grave mistake – born, of course, of NATO’s (the real enemy’s) attempts to weaken the EU, the UK as ever acting as US lapdog – to allow most of the Eastern European countries in so soon. That may yet prove fatal, but we must do what we can, not only to resist the outright fascism now prevailing in Poland and Hungary, not only to help the many good, civilised people within those countries (suffering still more quickly from the deadly embrace of neo-liberalism than we are), but also to rescue Europe from US imperialism, and to look towards an order that might one day also involve Russia. Russia, lest we forget, is European too; the antagonisms whipped up, not least by the EU as it stands, need to be dealt with – and it is difficult to see who can do that other than a reformed EU. NATO – the government will allow us no plebiscite on that membership – has persistently divided Europe; we need something to bring Europe and indeed the world together. As for the absurdity of wishing to be bound by the EU’s rules without having even the slightest say in making them: that is preposterous even by the standards of Michael ‘if you know something, you’re a Nazi’ Gove. Yet above all, however naïve this might sound, however naïve this might be, the question is: do we wish to return to the 1950s, or rather 1930s, do we wish to start acting in a vaguely twenty-first-century fashion? Do we wish to banish war from Europe, by continuing to suppress nationalism, by continuing to cooperate, by continuing to build a common foreign policy (something that would, for instance, prevent the UK from ever again engaging in a murderous adventure such as Blair’s invasion of Iraq)? Do we wish to break down borders, to put a stop to this country’s embarrassing self-exclusion from the Schengen accords, to participate in a Europe in which travelling, whether in the shorter or longer term, from London to Paris is no greater a step than from Berlin to Munich, or indeed from Florence to Vienna? Do we value people because of who they are, what they do, what they might do in the event of our cooperation, or do we spit on them on account of their nationality, their gender, their sexual orientation, the colour of their skin? (Let us not forget that the Tory Right, let alone UKIP, wishes to do away with the ‘red tape’ that protects citizens against discrimination.) Do we welcome those who wish to make this country their home, who enrich our lives with their labour, their enthusiasm, their culture, or do we follow the lead of Gove, Mann, Nigel Farage, Frank Field, Boris Johnson, Paul Dacre, and the organs of Rupert Murdoch, in blaming ‘immigrants’ for our ills? Do we hold our ground against neo-liberalism, against the vicious far-Right press, or do we offer our final, abject capitulation? Do we want to be able to look our European friends in the eye? Or do we want to be the country that brought a deeply flawed project, which nevertheless offers our only realistic hope for something better, crashing to the ground?